This afternoon Lisa Randall, one of the most famous theoretical physicists of our time, received from the hands of Flavio Zanonato, mayor of Padova, the keys of the city. The ceremony is part of this years' celebrations for the Anno Galileiano, and the World Year of Astronomy. Padova is the place where Galileo Galilei, the father of the scientific method, taught for 18 of his best years. To commemorate Galileo and popularize science, the city of Padova has set up an excellent exhibition dedicated to his work and the scientific method. Also, the city has started giving the title of honorary citizen to distinguished scientists. This year Edward Witten received the title a couple of weeks ago, and today was the time of Lisa. The mayor introduced the ceremony by reminding everybody about Galilei's work in Padova. The hope of the city's administration is to stimulate citizens into a deeper involvement with Science, particularly youngsters, to affirm a culture of rationality, of reason, and to respect for other people's ideas. 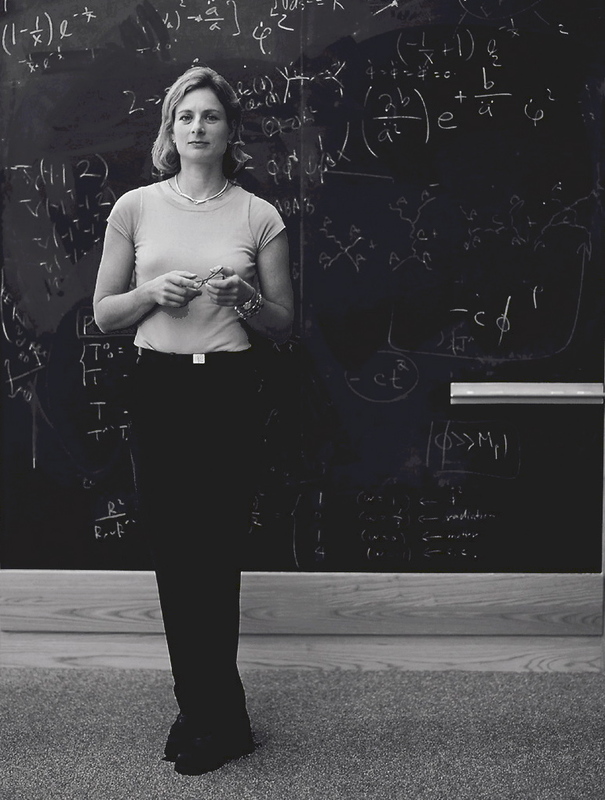 "Padova, thankful for the contribution to the study and diffusion of theoretical physics, with her studies which contributed to the evolution of scientific thought, awards Lisa Randall honorary citizenship." Lisa thanked the authorities and the audience. She mentioned that everybody abroads knows Italy for its importance in Arts, but it is also a wonderful place for Science. She said she felt proud to be a citizen of Padova. I believe she did not lie. Then Lisa was introduced formally by Professor Fabio Zwirner, a Padova University theorist, who gave a few biographical notes, centered on her very brilliant and fast career, which saw her getting a PhD. in Harvard in 1987, and soon thereafter an assistant professor position at MIT, and then full professor status at Princeton, MIT, and finally Harvard again. Zwirner mentioned Prof.Randall's contributions to cosmology, physics beyond the standard model, and in particular her model of 1999 with Raman Sundrum (now at Johns Hopkins in Baltimore), where they hypothesized that space dimensions are four, explaining with it the weakness of gravity with respect to the other forces of Nature. This is a theory that is remarkable for its simple solution of the problem of hierarchies -the existence of very different energy scales in fundamental physics. The other noteworthy fact about this is that the theory is actually testable, by probing the existence of particles that can propagate in the fourth dimension, with signatures that are spectacular at the Large Hadron Collider. Lisa Randall is also a renowned writer of science popularization. She published a very successful book, "Warped Passages", which made her as famous among non-professionals as her 1999 papers had made her among colleagues. Some words were then spent by the University rector Vincenzo Milanesi. He most notably mentioned that Padova is an appropriate place to give honorary citizenship to a distinguished female scientist. Padova University was the first in Europe to give a degree to a woman, Elena Cornaro Piscopia (left), in 1678. He also mentioned the presence in the audience of Professor Massimilla Baldo Ceolin, who was the first woman to be a full professor in Padova. And then, it was time for Lisa to give her lecture. Lisa started by saying that she wanted to give us some flavor of the type of work that others attending the Planck 2009 conference this week have been doing. Some of the ideas that are being studied may be highly speculative, but in large part they might be tested directly with experimental data very soon, or even now. This is a very interesting time for the science we do. We explore different scales, of energy and space, and lately physicists have been studying scales smaller than before, and also at the other frontier, that of large distance scales, through cosmology, and looking for dark matter. From the point ov view of experiments it is also very exciting: we are going to learn things about the way we understand the Universe. As particle physicists we are trying to understand Nature's most basic elements. Going inside matter, asking ourselves what are the most elementary things that we may find, and what are the forces by which these bodies interact. We would also like to understand the connections to cosmology, and how the universe has evolved. We can deduce properties about matter by looking at the sky. For instance we have discovered that there is matter out there that we have never seen. So this interplay is a fascinating area of study. In some sense we are trying to put together some of the most basic theories, such as string theory: this is based on the idea that there are elementary extended objects called strings whose vibrations give the observed properties of matter. However these cannot be explored by experiment, and we rather want to build connections with things we can actually study. Lisa said she wanted to be clear about her area of Physics: this is the interplay between several theoretical ideas, and also properties that can be tested a bit in the future, where we are trying to understand the relationship between the quantities that describe the World in which we live. One of the most important questions of high-energy physicists today, which sounds very abstract, has to do with a model we have built, the standard model. It is a definite model that tells what are the elementary bodies and the forces through which these interact. It works extremely well. Why do we think there is something beyond ? Because it is not self-consistent. One of its flaws is the so-called problem of hierarchies, one that has been there for thirty years: still, we do not know what is the right answer among several. This is a problem of mass scales. One way to understand the problem of hierarchies is the following: why gravity is so weak ? It is much weaker than the other forces we know about. In terms of mass scales, one that is extremely relevant is the weak mass scale, 100 times the mass of a proton. However, we know that there is an enormous, higher energy scale, sixteen orders of magnitude higher, inaccessible to experiments, that sets the strenght of Gravity. The fact it is so enormous compared to the weak mass scale, tells us that Gravity is so weak. Why are these two so enormously different ? It is a problem when you work out the consequences in quantum mechanics. Only by fudging the theory, putting in some fine-tuning, we can make things work. Quantum mechanics indicates that this difference of mass scales is really a problem, and as physicists we want to solve it. The Large Hadron Collider, the machine about to start operations in Geneva, will accelerate two beam of protons at higher energy than ever seen before. By studying this energy we want to precisely explore the scale of the weak interactions, that we believe will give us clues to the origin of mass. Another topic wich is important for particle physicists and astronomers is dark matter. Just to remind you, we know only 5% of the matter-energy budget of the Universe. An additional 23% of it is thought to be a different kind of matter, one that does not emit or absorb light. It is dark, not matter we know about because it is not interacting through electromagnetism. The rest is dark energy: a hefty 72%, which is even more mysterious. The reason to mention dark matter now is that there is a possible intriguing connection that by studying the weak mass scale we might discover the constituents of dark matter. There are experiments today that are directly looking for dark matter: even though it is dark, it still may have some interaction that we may be sensitive to, with carefully crafted instruments. And there is also the possibility for indirect detection, when dark matter annihilates producing detectable photons or positrons. We can try to judge or guess what lies behind the SM, why is this energy scale what it is, and what are the cosmological implications. Of course we want to understand what are the implications, what it will look like at the LHC or at other dark matter detectors. Lisa then said that she regretted of not having enough time to explain what are the different possibilities, but there are surprisingly few ideas that can fit together all those clues. One thing is called supersymmetry, and it is very fashionable; however, there is a more exotic idea. Randall and Sundrum ended up thinking about an extra dimension of space! Maybe there is another dimension of space, sounds like a big leap of reason, but this is justified because there are no explanations for what we see. The idea might work in explaining all the things we know and the inconsistencies we find. What are the dimensions of space ? The idea of an extra dimension sounds exotic, we know three dimensions of space, you can think of the dimensions as the number of quantities that pinpoints a point of space. How can we think about a fourth dimension ? One idea was introduced in the late nineteenth century, Edwin A. Abbott had an idea of creatures living in a two-dimensional World. He called it Flatland. If you think about Flatland, you might come up with the question: what would a sphere look like if it came to flatland ? Wht you would see is a series of disks that grow in size and decrease until they disappear altogether. The people in Flatland would still see the sphere. In their head they would be able to know that a third dimension of space must exist. If a four-dimensional sphere passed through our World, we would see a set of spheres decreasing and then decreasing in size as they pass through. So how do we think about dimensions? One way is slices. Another is projections. Looking at a single lower-dimensional projection you may lose information, but by putting together different projections you can recover it. From the idea of an extra dimension follows the idea of Braneworlds, where "brane" is a shortcut for "membrane". This refers to the fact that you can have a lower-dimensional surface in a higher-dimensional space. We imagine we can have an extra dimension and live in a three-dimensional world inside a larger-dimensional one. Also string theory actually involves higher-dimensional objects, still called branes. All matter may be stuck to these branes, when only Gravity might be able to travel through the extra dimensions, as shown in the figure on the right. We would be "stuck in the brane", and Gravity would be weak for us. Just to give a simple analogy, a brane is like a shower curtains. It has two dimensions but you can have droplets of water that live on top of the curtain. It could be that we only explore three dimensions although more dimensions exist. Then one may think of extra dimensions of space as containing a "Gravity brane" and a "weak brane". The Einstein equations of general relativity describe what geometry is; Gravity is exponentially weak near the weak brane. And then there are warped passages: spacetime is warped, and we see only the exponentially small part of Gravity, that is why it is so weak. This idea has experimental implications at the large hadron collider. What we find is that with two protons that collide, they produce a particle called Kaluza-Klein, that travels in the extra dimension. What would happen is that it would decay back into particle that we know about. The experimentalists can thus find an electron and its antiparticle and reconstruct what was there and whether this KK particle does exist. So we are at the point now when there are many new theoretical results, and we would like to know which ones are right. Some of the most exciting possibilities involve Physics at the weak scale. This topic overlaps experimental physics and cosmology, and more theoretical developments. Lisa meaningfully asked the audience the question: How can we choose not to explore these intriguing possibilities ? Her bottom line is that there could be hidden riches in the universe, and it is up to us to find them! After Professor Randall finished her talk, she took a couple of questions. One was remarkable, given the audience in the room: she had shown a quick slide with two protons at the LHC colliding and producing a Kaluza-Klein particle which then decayed to an electron-positron pair, and the Padova Mayor Zanonato (left) asked what had happened to electric charge. Indeed, you seem to lose two units of electric charge in the reaction! I was sincerely amazed, and also very pleased, by the excellent question of Zanonato. Lisa explained that what collides are actually quarks, or gluons, inside the protons. Charge is not involved in the production process, and it passes through. The proton is a bag of junk, and this junk carries away the charge. These are things that you know very well by now if you have read this blog for long enough, but I still found it a remarkable question from a city mayor!